I was going on about winter stores, feeding, and mite treatment in the last blog post. This posting is about the more physical aspects of winter preparation at Brookfield Farm Bees And Honey, here in the land of wet, windy, and cold (aka northwest Washington state). All my hives get a bit of two-inch insulation at the top of the hive in the winter. This is placed on top of a piece of burlap that sits on the top bars. The collar that sits on the hives year round provides the space for this. The collar has the top entrance(s), and a bit of screened ventilation at the back. The two-side ventilation is based on the same principle as our barn (the hay loft has open areas at each end to allow for ventilation). The fall feeder that sits in the collar is removed. The faint circle at the front is the upper entrance (7/16″ – anything bigger and mice slide in – smart and skinny mice in Maple Falls). The burlap that covers the open top bars year round is laid back down, and a new one added if the girls have removed too much of the material. The insulation is placed on the burlap, and the top cover put back on. There is enough space left above the insulation to allow the bees to walk up there if they are inspired. In the spring, I find them exploring this area. Did I mention it’s wet and windy here? I use rolled asphalt mineral roofing for rain hats. This is the kind of roofing that’s used in the U.S. for flat, or gently sloped roofs – not the tarpaper that goes under the rolled roofing asphalt. It amazes me that I can find the rolled roofing here, as roofs like that seldom meet building codes due to our snows. I cut 26 inch pieces of the roofing – one for each hive. My hives usually set side by side in pairs (on concrete blocks), but they are seldom the same height. Sometimes due to a hive loss one hive will sit alone. I know a beekeeper who has 2-story hives on pallets of 4-hives-to-a-pallet. He just rolls the roofing over them all. But roofing alone will not stay down. So each hive or pair of hives has a tie down. I got all fancy this year and tied a separate rope around each concrete block, on either side of the hive or hives. This allowed me to just tie the hold-down rope on, toss it over the hive(s) and tie to the other side. Took more time to set up, but I think it will allow faster access to the hives in the spring. 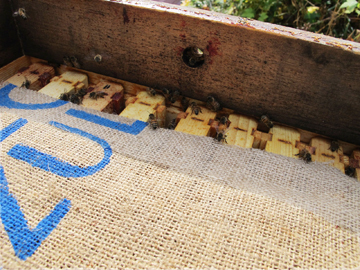 The above is a hive (first 4 boxes) and a nuc (top two boxes). Most of my hives are four boxes tall, strong nucs are three boxes tall, tiny nucs are two boxes tall. This could come under “experiment number three” for this winter. 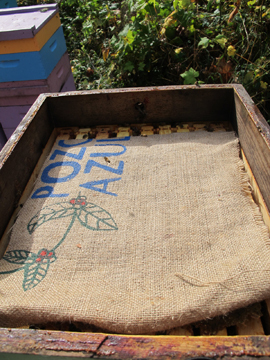 I use “commercial” hive tops, not telescoping, (the edges of my tops sit flat with the boxes, no overhang). 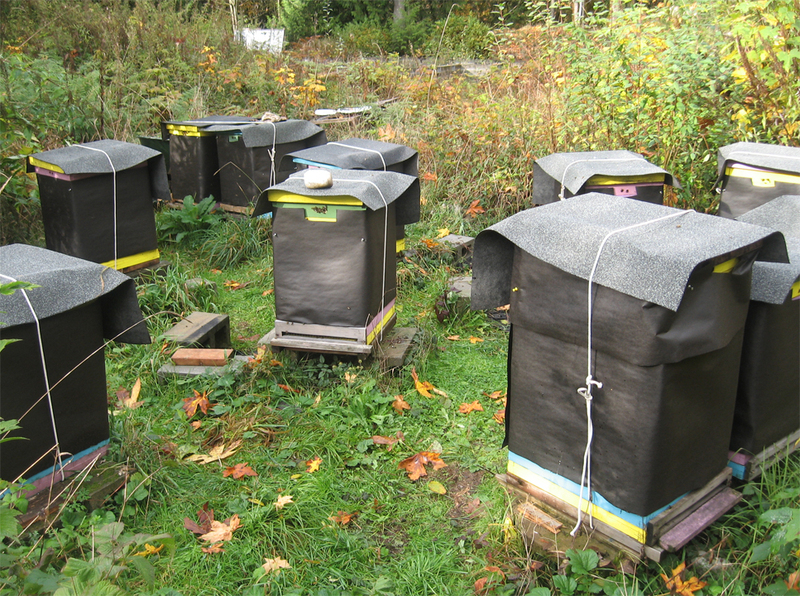 I have always loosely wrapped my hives with tarpaper, pinning the billowing sides in with pushpins. I figure this as a windbreak / horizontal rain excluder. 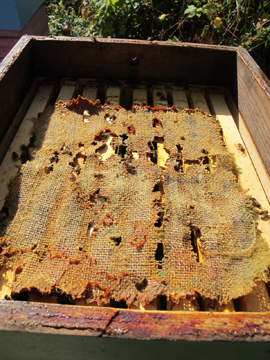 Friends have mentioned that it might be causing more troubles than it is solving: that it keeps water in the hive. This year the majority of my hives will not be wrapped. Up-river (the land of deep snow) I am going to wrap about 50% of the hives, trying to make sure I have ones of comparable hive strength. We shall see. I will say that as of this writing it has been pouring rain for 4 days. When I went to put rain hats on the final bee yard, I peeked under the tops during a break in the weather. They were dry. Personally, I would be very happy if I did not have to wrap hives. It takes a lot of time. But I shall worry for the entire winter. But then, to say I worry is like saying the earth turns; it’s not really news. Thought I’d just mention what I’m doing now (it’s raining), other than sitting at the library posting this (did I mention this is the land of dial-up only and no cell/mobile service?). The honey shed is finally painted and the last lamp installed. I left that off in the spring. It’s nice that it’s finally done. That’s the news from Brookfield Farm Bees And Honey, Maple Falls, Washington. What winter chores are you on to – or spring chores if you’re south of the equator? This entry was posted in Beekeeping and tagged Brookfield Farm, covers, hive, insulation, Karen Bean, Maple Falls, preparation, rain, tie downs, Washington, Winter, wrapping. Bookmark the permalink. The honey supers stay on until mid to late fall—usually after the last flower dies. Holistically, the Annual Honey has the entire year’s pollen to help with next year’s allergies. This year I did make extra honey by increasing the size of my colonies, but not enough for them and for me. Bee hives do not fatten up in farming communities as they do elsewhere because of GMO crops. I’m fairly certain I’ll have enough to feed to my two dogs (a tbsp a day keeps them worm-free). I’ll take my share after I’m certain my girls have enough to get them through to spring. In the past, a 2-box deep brood with one medium honey super has been sufficient. If I have to feed, I make sure at least 25-30% of the sugar feed is honey. Bees need their nutrients to come out of the winter in good health. Honey keeps the Nosema in check. Hi Rodolfo – I’m leaving more honey on my hives than ever before. Our winters are getting warmer (and wetter) which keeps the bees inside, but not in tight cluster, so they consume more. I never thought about bees not putting up enough stores in GMO crop areas – what a disaster! I’m glad to see someone else discovered the wonders of honey-as-wormer for dogs. It kept our 18 year old pit bull in good health until he passed on from old age.